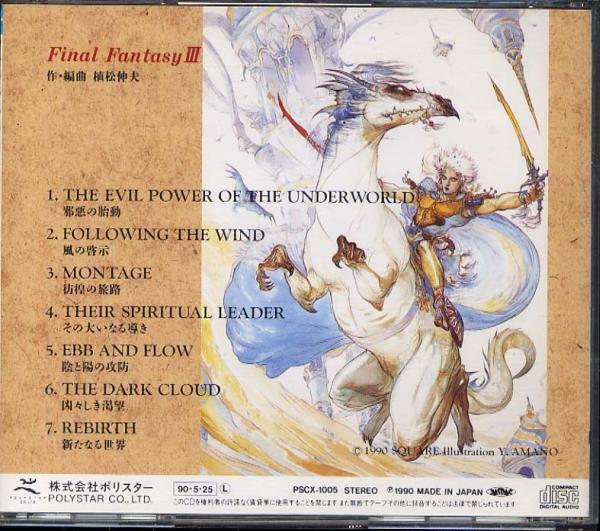 Si hay que elegir un CD como el más raro de cuantos hay en los Final Fantasy (y eso que los hay raros), este CD supera a todos. Casi todos los temas comienzan con un narrador, y luego van sonando melodías a cada cual más extraña. Son sólo siete temas pero en cada uno contiene músicas muy diferentes. No hay temas en orquesta. Pese a no ser muy conocido la crítica en general lo tiene muy bien considerado (yo incluida), sólo le echan en cara tener un narrador demasiado largo pero para el que está aprendiendo inglés es perfecto. Es uno de mis discos favoritos. En opinión mía y de un colaborador es uno de los mejores de la saga pero no creo que haya unanimidad en ese tema. Abajo teneis los narradores por orden. One day, a sudden, massive earthquake struck, shaking the bowels of the earth into complete darkness. Four magic crystals, which had been maintaining the earth’s balance up until then, were lost, and buried deep beneath the earth. The evil elements of the earth, which had been kept down until then, came to life, and humanity was thrown into a living hell on earth. The windy city, Ur. The damage from the earthquake that occurred here was relatively slight. Most of the people were convinced that the wind crystal must be living in the underworld and protecting them…and they were right. One day the wind crystal arose from the underworld and chose four youths to find the remaining three crystals that would save the world. Off on their journey, the youths ventured forth; and, as a soft breeze whistled gently through the trees, the group of four strained their ears to hear hopes, dreams, desires. The wind spoke of all, and the four valiant youths listened sympathetically to the wind, believing that in return, the wind crystal would shower them with light again. For the four valiant youths, this mission was a novel experience, and each of them was overflowing with curiosity. Everything they saw appeared extraordinary, yet they were completely void of fear. Thoughts of ghosts and evil powers didn’t even enter their minds. They felt as if they could journey on like this forever, traveling to the outer reaches of the universe. Esta también es tema de Dido. Sometimes the four valiant youths thought they heard the wind calling softly to them…and they really did. When the four youths were feeling depressed and at a loss for where to turn next, the wind’s voice encouraged them to keep trying. When they were lost and didn’t know which way to turn, the wind gently led them in the right direction. While the four youths suspected the wind was helping them, little did they know that the great Doga was also watching over them. Es curiosa la letra de The Breeze, es una enorme metáfora. La primera vez que leí la letra me pareció que la metáfora es la de la muerte. Yo supongo que irá con el contexto del juego (no lo conozco), pero si os fijais bien podría ser esa la interpretación.The breezeAre we strangers in this place? Looking for a place unknown? When the long journey ends?Are we wrapped in mysteries? Walking down the winding roads? And you will see how all is sight…Are we strangers in this place? Reaching out for dreams unknown? In any legend, there are a variety of contrasting emotions: love and hate, courage and fear, joy and pain. The youths, in search of the remaining crystals, also experienced these opposing sentiments. Yet while their journey read like any story of old, the ending was very different; for the youths, rather than finding the crystals and saving the world, found themselves utterly hopeless. It is when one thinks one knows everything there is to know about the earth that God snarls in the face of such fools. In this world, God will show only those overflowing with curiosity and expectations a small portion of Her kingdom. Those select few will thus eventually be able to find the light at the end of their tunnel–or, in this case, the light that will save the world, thus reminding them just how divine God really is. If it is necessary to choose a CD as the most strange (the competence is hard) the prize would win it this one. Almost all the topics begin with a narrator, and then melodies are sounding to everyone stranger. They are only seven topics but in each one it(he,she) contains musical very different. There are no topics in orchestra. In spite of the critique not being very known in general it has it very well considered (I included), only they throw it in face to have a too long narrator but for the one that is learning English it is perfect. It is one of my favorite discs. In my opinion and of a collaborator it is one of the best of the saga but I do not believe that there is unanimity in this topic. Certainly in the libretto says that the feminine soloist is at all more and nothing less than Dido! This girl is also Dido. It is the narrator from seventh theme because the sixth hasen’t got. Se bisogna scegliere un CD come il più raro di quanti è nei Finali Fantasy, e quello che ci li sono rari, questo CD supera tutti. Quasi tutti i temi cominciano con un narratore, e dopo continuano a suonare melodie ad ognuno più strano. Sono solo sette temi ma in ognuno contiene musiche molto differenti. Non ci sono temi in orchestra. A dispetto di non essere molto conosciuto la critica in generale l’ha molto bene considerato, io inclusa, gli rinfacciano solo avere molto un narratore troppo ma per il che sta imparando inglese è perfetto. È uno dei miei dischi favoriti. Nella mia opinione e di un collaboratore è uno dei migliori della saga ma non credo che ci sia unanimità in quello tema. Per certo nel libretto dice che la solista femminile è nient’altra e niente meno che Dido. Sotto avete i narratori per ordine. Anche questo è di Dido. È curiosa la lettera di The Breeze, è un’enorme metafora. La prima volta che lessi la lettera mi sembrò che la metafora sia quella della morte. Io suppongo che andrà col contesto del gioco, non lo conosco, ma se vi fissate bene potrebbe essere quello l’interpretazione. The breeze Ari we strangers in this place? È il narratore del settimo tema perché il sesto non ha narratore. Articulo publicado en Relacionado con videojuegos con las etiquetas: Final Fantasy, final fantasy III. Guarda el enlace permanente. ¡IMPORTANTE! Responde a la pregunta: ¿Cuál es el valor de 6 6 ?